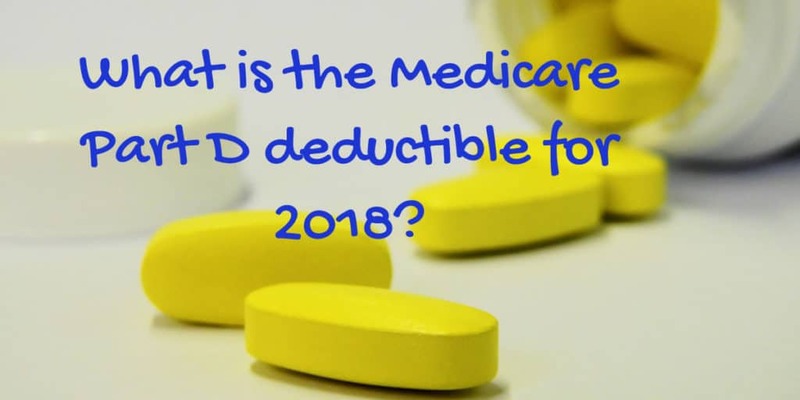 What is the Medicare Part D deductible for 2018? If you are on Medicare, you probably familiar with the Medicare Prescription Drug plan. This plan has a Medicare Part D Deductible, which changes every year. Also, if you don't sign up for this “optional” plan, you could wind up with significant penalties later on. This is what happened to my husband, and was actually the catalyst that got me into the Medicare business. A sales person sold him a Medigap Plan but told him that since he didn't take any drugs, he didn't need a drug plan. Well, that wasn't quite correct. Medicare Part D is technically voluntary, but if you don't sign up when you are first eligible, and you don't have creditable coverage, a penalty of 1% per MONTH starts building up. In my husband's case, we now pay more in penalties each and every month than we pay for the actual plan itself. 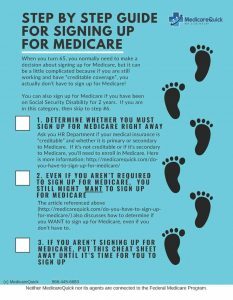 In addition to the penalties, there are other things that you should know about Medicare PDP plans. One such item is that there is a “donut hole” in which your costs go up. Basically the donut hole begins after you and the drug plan pay a specified amount set by Medicare. My Free online class discusses this. Now, let's get to the deductibles. You probably already know that the deductibles for your drug plan change every year. Below is a list of the Medicare Part D deductible amounts from 2011 through 2018. The insurance company can have a deductible less than the amount listed, but it cannot be more. In 2011 the Medicare Part D Deductible was $310. Then in 2012, the Medicare PDP deductible increased by $10 up to $320. In 2013 the Medicare Part D deductible was $325. For 2014 the Medicare Part D deductible was down to $310 again. Then in 2015, the PDP deductible increased to $320 again. In 2016 the Medicare Part D deductible was $360. And jumped up by $40 in 2017 to $400. By 2018 the Medicare Part D deductible was $405. 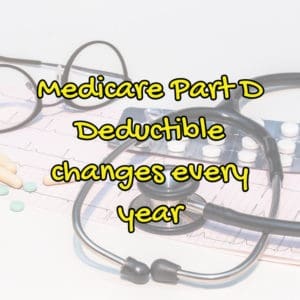 What will the 2019 Medicare Part D deductible be? I don't know but I'm guessing it will go up. For more information about Medicare Part D, or any Medicare related questions, sign up for our free online classes at MedicareQuick.com/Class or contact us via this form and we'll get back to you as soon as we can!